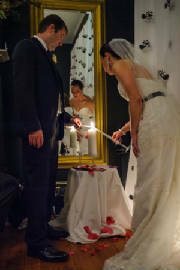 Please take time to enjoy the pictures of various add-ons that have been part of my ceremonies. Any one of them can be adapted to your style and taste to make your ceremony absolutely "perfect" or you can create your own. One Add-On is available with the Basic Deluxe and Unlimited Add-Ons are available with the Full-Service Package. "On this day as I marry your mom, I also marry you. I promise to love you and protect you always." 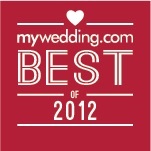 A beautiful, heart-warming time capsule of the love you share on your wedding day. 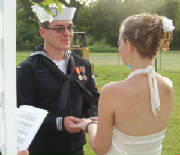 This couple chose to incorporate an add-on to honor deceased and current military family members. 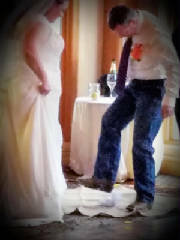 This young couple chose to throw a rose in the river in honor of deceased family members memory. Roses are and always have been a symbol of what matters most... love. This is perhaps one of the most touching add-ons I have ever had the privilege of officating. 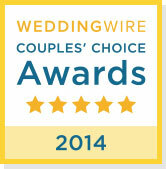 Greek weddings are beautifully enhanced by crowning the bride and groom with Stephana. 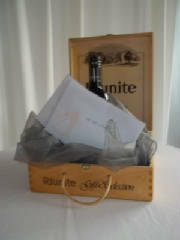 A bottle of favorite wine and love letters are placed in a box for a special anniverary or occasion. A Candle is lit in memory of loved ones who are present in spirit and sending love from heaven. Children of blended families vows to love each other and play together united as family. 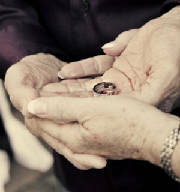 This add-on sets the premise that a couple's hands bind them as tightly as their marriage vows. Incorporating children in a ceremony is always a good choice and this is a PERFECT way to do it. This little guy served as Ring Bearer and did an ABSOLUTELY wonderful job. 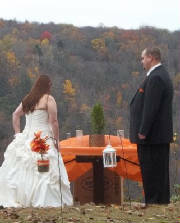 A perfect way to honor Native American traditions in your ceremony. In this Add-On Rings are passed to family members then warmed and blessed with their love. This couple chose to incorporate British and American Flags to symbolize family heritage. 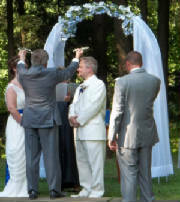 Three individual containers of sand are poured symbolizing the Bride, Groom and God in the marriage. 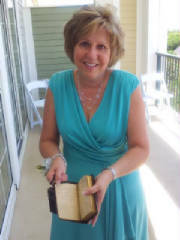 Many couples add this Jewish traditional add-on at the end of their ceremonies. Mozel Tov! Some couples choose to plant a tree that they can watch grow as the garden of their love matures. 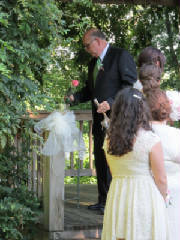 Parents share a blessing on the marriage and place a flower in the vase as a token of their love. 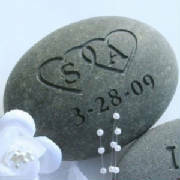 Guests pray marital blessings while holding small stones and the couple takes both when they leave. 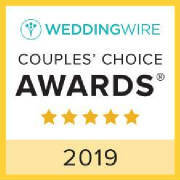 "Tying the Knot" with the Celtic tradition of Handfasting. they will be more binding.